What does ‘reasonable cause’ mean? Don't ask anyone in the Pennsylvania Senate. But the history of tyranny tells us. The Pennsylvania state Senate on Tuesday, November 17, conducted an embarrassing hearing that not only demonstrated the weak grasp many senators have of their own state constitution. Even worse, the hearing demonstrated the senators don’t know where to look to find out what the constitution actually means. 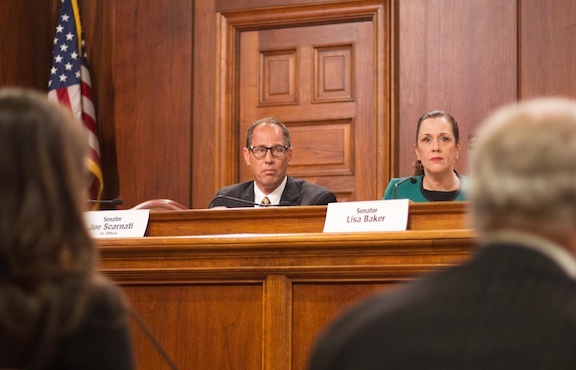 The hearing, conducted by the Senate’s Special Committee on Senate Address, was supposedly convened to explore the Senate GOP leadership’s desire to remove state Attorney General Kathleen Kane from office without the trouble of impeachment proceedings begun in the state House. AG Kane has questioned the jurisdiction of the Senate to conduct these hearings, and for good reason. The senators have latched on to an obscure clause in the state constitution clearly meant, records show, to remove mentally and physically incapacitated officials from office. What’s the meaning of this clause? Tuesday’s Senate panel was supposed to explain all this. Unfortunately, the panel, and the Senate committee, failed. And failed badly. 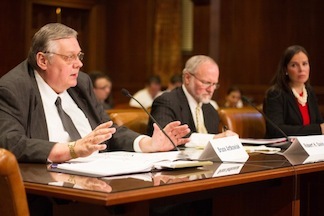 Tuesday’s panel before the Senate committee was comprised of three state attorneys and law professors: Bruce Antkowiak, professor of Saint Vincent College; Robert Davis, Jr., professor of Widener University’s Commonwealth Law School; and Beth Weisser, a partner in the Philadelphia law firm Fox Rothschild. Panel (l to r) Profs Bruce Antkowiak, Robert Davis, and Beth Weisser. In top photo, Senate President Pro Tempore sits in on committee hearing. The panel members attempted to deal with both deep, and shallow, constitutional questions lobbed at them by senators on the committee. But even in the shallow waters, the panel had problems. The panel waded in with uncertainty on even the shallow-water question of whether Kane, whose law license was suspended, could still serve as attorney general. So even this relatively simple issue is a controversial one, and is not the slam-dunk that the Senate leaders hoped it would be. But matters at the Senate committee hearing quickly grew worse. 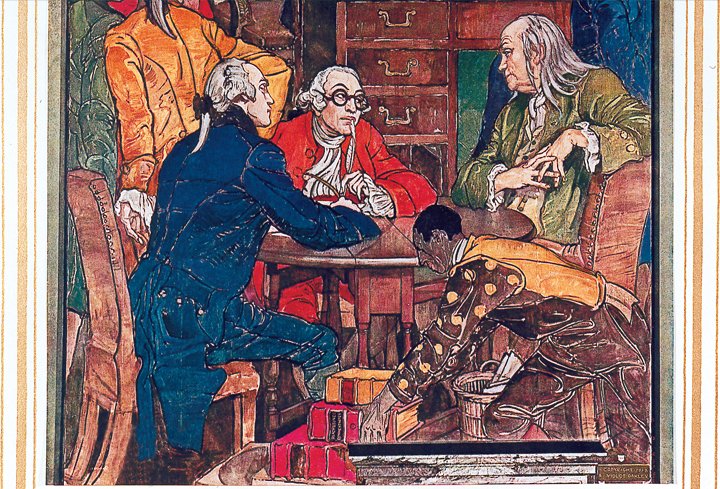 When the committee and panel waded into still deeper constitutional waters of the Senate’s jurisdiction to remove Kane outside of impeachment, and the framer’s intent behind Article VI, Section 7, and the meaning of the crucial two words, “reasonable cause,” all of which were added to the state constitution in 1874, things quickly fell apart, and became embarrassing. Panel members were asked if they knew the meaning of the phrase “reasonable cause” found in Article VI, Section 7. Nor, it turns out, did any of them know much about the history, nor the intent, of Article VI, Section 7, which they improperly hope to invoke against AG Kane. To understand Article VI, Section 7, its purpose to remove mentally or physically incapacitated office holders, and the meaning of those two words, “reasonable cause,” senators and others interested must read the 1885 removal-from-office case of Allegheny County Judge John M. Kirkpatrick. In 1885 Judge Kirkpatrick, suffering from severe mental and physical difficulties, was removed from the bench by the state House and Senate, which jointly used the new provisions added to the state’s 1874 constitution a little more than a decade earlier. Judge Kirkpatrick’s case explains everything. A close reading of Judge Kirkpatrick’s removal case explains three things important to us, all of which are extremely pertinent to today’s Kane case. First: what is today’s Article VI, Section 7, was written in tandem at the 1872-73 convention with an almost identically phrased article meant to apply to judges like Kirkpatrick -- Article V, Section 15. It was this Article V, Section 15 that was used in 1885 by the House and Senate to remove Kirkpatrick from the bench. Kirkpatrick was a judge, so Article VI, Section 7 wouldn’t apply. But Article V, Section 15 did. Even so, these two sections, the Kirkpatrick case explains, must be read together to decipher the clear intent of the framers. Second: the intent of both of these articles, today handed down to us and causing so much consternation, was clearly and absolutely meant to remove office holders with mental and physical disabilities, not rising to impeachable offenses, and not transgressions involving “law or morals,” as AG Kane’s legal difficulties clearly are. In 1885, state legislators also stumbled over those two very words. It turns out that “reasonable cause” has a very specific meaning, having little or nothing at all to do with a law license suspension. The phrase “reasonable cause,” it turns out, harkens back to the dark days of the tyranny of seventeenth century English King William III. At one time, any subject of the crown, private or public, and not just a judge or office holder, could be “impeached” by the King or his Parliament. With time, only office holders could be “impeached.” That was a reform. Under King William III, the Kirkpatrick case explains, any judge could be removed for any reason, or no reason at all. “The right to remove judges at pleasure by the sovereigns of England was, at one time, claimed to be a prerogative of the Crown,” the Kirkpatrick papers read. In other words, “reasonable cause” became a liberty. A constitutional protection. You could no longer simply remove someone without cause, as William III did. You needed to state a cause to do it. These two words quickly became important boilerplate touchstones of reform in constitutions throughout Europe, and in the young United States. So the words “reasonable cause” are constitutional terms-of-art, if you will, meaning that you must have some cause, that you can’t simply act arbitrarily. It has little or nothing to do with AG Kane’s law license. I found it startling that the Senate committee and their panel of experts didn’t know this history. The 1885 Kirkpatrick case tells us even more. As the Kirkpatrick case explains, we must read Article V Section 15, and Article VI Section 7 in tandem. They were meant to do the same thing, for the same reasons: removal of office holders for mental or physical illness. Article V Section 15 applies to judges. Article VI Section 7 was meant to apply to office holders who are not judges. So Attorney General Kane is correct. The Senate under Article VI, Section 7 does not have jurisdiction to remove her from office. That power belongs to the House to impeach her, and the Senate to try her. I’ll write about the Kirkpatrick case at length in the coming week.